In a surprise move, National Federation Party’s three members- leader Biman Prasad, Pio Tikoduadua and Lenora Qereqeretabua voted for the Government nominee and against SODELPA’s nominee. New Speaker Of Paliiament Hon. Ratu Epeli Nailatikau inside his office after being elected during yesterday's Parliament sitting. I am here as the servant of this house said newly appointed Speaker of Parliament Ratu Epeli Nailatikau yesterday. The former President was elected by 30 votes to 21 to fill the role left vacant by the late Dr Jiko Luveni who was laid to rest in December last year. The opposition party Social Democratic Liberal Party (SODELPA) had nominated lawyer Tanya Waqanika. This was confirmed by the Party leader Biman Prasad as they made the decision for the right nominees on Monday. “I can confirm that National Federation Party supported Ratu Epeli Nailatikau as the Speaker of Parliament. 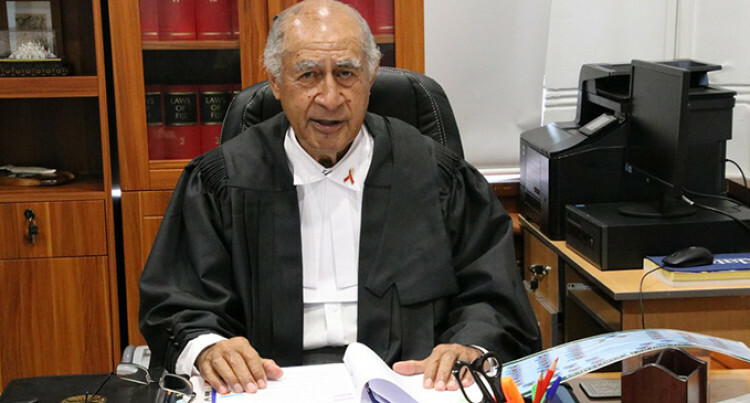 We don’t have any comparison for the two nominees but we have made up our decision to nominate Ratu Epeli,” Mr Prasad said. Ratu Epeli in his first address as Speaker of Parliament says he knows it’s a difficult task because he served as Speaker from 2001 to 2006. He highlighted how he was appointed Speaker of the House in 2001 in the spur of the moment after initially accompanying his wife, Adi Koila Nailatikau who was to be sworn in as a Senator. This time around, he met with Prime Minister Bainimarama and got his briefing two weeks ago. The Fiji Sun first revealed him as the likely Government nominee on January 7 and listed down other possible candidates and again on February 1 as the one Government would nominate for the position. Ratu Epeli’s attire represented what he holds dear. He wore the red and green military tie which was a tribute to his 20 years in the military. He had a HIV pin on his collar which represents his ambassadorship of UNAIDS. He was born on July 5, 1941, and is married to Adi Koila Nailatikau Mara. He has one son and one daughter. His career started in 1962 when he joined the Royal Fiji Military Forces. He served as the Commander of the RFMF from 1982 to 1987. Ratu Epeli Nailatikau was the President of the Republic of Fiji from 2009 to 2015. His first appointment was from November 5, 2009 to November 11, 2012. He was then reappointed as President from November 12, 2012 to November 11, 2015. He has had a long and distinguished career in the Military, diplomatic service, and the Government. From 2001 to 2006 he served as Speaker of the House of Representatives. He served as Deputy Prime Minister and Minister for Fijian Affairs from July 2000 – September 2001. On June 14, 2005, Ratu Epeli Nailatikau was appointed the UNAIDS Special Representative for the Pacific.